The recent bombing of a UN compound in Mogadishu has increased Somaliland’s drive for independence. A senior Somaliland politician has condemned the tragic terror attack on a UN compound in Mogadishu, but says it strengthens claims for secession from Somalia. Mohamed Omar, the breakaway state's foreign minister, says that Wednesday's bomb-and-ground-assault [19 June 2013] by Al Shabaab should prompt the international community to rethink its vision for a united Somalia, while stressing the need to be 'vigilant' of the spread of Islamism across the Horn of Africa. The attack left at least 13 dead including four foreigners. Wednesday's attack is the latest blow to harmony in Somalia's troubled capital, despite its government receiving recognition by the US and International Monetary Fund last year. Some 18,000 African Union forces are stationed in Mogadishu. 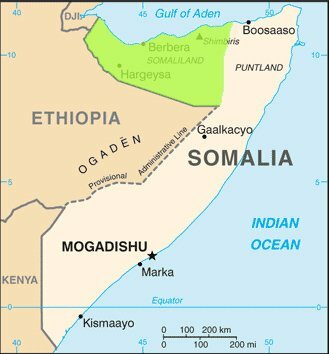 But Al Shabaab, a terror group with close ties to Al Qaeda, still controls vast swathes of land around the city, enforcing its strict interpretation of Sharia on millions of Somalis. Somaliland, whose own armed forces number some 35,000, has remained relatively peaceful since car bombs in Hargeisa and Bosaso, a port city in neighbouring Puntland, claimed 29 lives in 2008. The breakaway state remains unrecognised despite Somalia's fragility. "An effective Somali government is the best way to fight the disease of Al Shabaab," said Omar. "The tragic events in Mogadishu show how difficult this is." Despite reports of skirmishes between Somaliland forces and Al Shabaab in the state's easternmost reaches, and that Al Shabaab leader Ahmed Godane hails from the capital city, Hargeisa, Omar feels that Somaliland is containing the threat of terrorism. However, the minister claims that a united Somalia would draw Somaliland into violence such as Wednesday's. "Thank God our youth are not turning to Al Shabaab. We are not at war. If recognition was based on security we would have recognition. However we must remain vigilant, always looking out. "If we join Somalia, we become the target. We hope the international community will rethink its position on Somaliland in light of these tragic events."